Seventeen years ago today I became a mother for the first time. My little boy — who’s not so little anymore — was born the day after I locked up my classroom for Christmas Break and three days before Christmas. It was a difficult birth, and it seemed like though my heart was created to be that of a mother’s, my body wouldn’t support my heart’s purpose. And just as it was difficult to conceive him, it became difficult to convince him to leave the womb. It didn’t matter how long or how hard I pushed, he wouldn’t move and actually settled in for a nap in the birth canal, completely unimpressed with the idea of being born. Unfortunately for him there was no time for naps, and we were whisked away for the doctor to evict him from his baby condo before our blood pressures dropped any further. Because I had to be put under for this Cesarean, I didn’t wake up for several hours after the birth of my son. This has always broken my heart, knowing I missed the first few moments of his life. I missed his first lusty cries for breath, signaling that a new life has taken charge of its body and a spirit has been claimed. I missed it all; will he know me? I’d bought the lies that society had told me that babies must bond in their first few moments of birth. I’d been told that real mothers give birth in a certain way, mothers’ milk will come in only once they held their newly born, and I’d expected while I was expecting just like I was supposed to. But would my boy know who I was even after missing the first few hours of his life with me? But my fears disintegrated once my husband placed my boy in my arms. He opened his almond-shaped brown eyes and looked straight into me, his little lips pursed as if to say, “So you finally decided to show up, huh?” and then, with a deep sigh, closed his eyes, settling into his cotton swaddling. He’s been a Mama’s Boy ever since. There have been times in the last seventeen years when I thought my heart was broken, or maybe altogether gone. When you struggle with depression as I do, there can be days when you feel completely hollow. And yet, I’ve always I had a little boy calling out, “Mama!” in my personal darkness, its echoes ricocheting in the mind’s chambers and waking me up enough to make his octopus hot dogs or watch Thomas the Tank Engine. 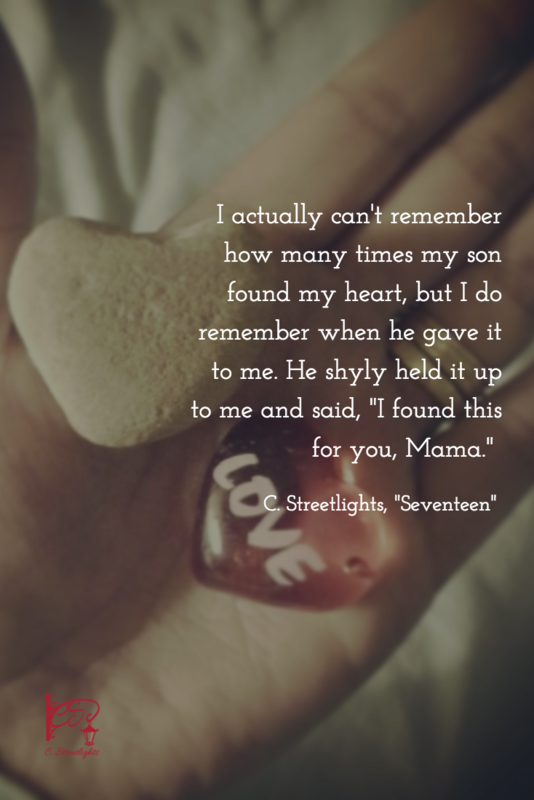 I actually can’t remember how many times my son found my heart, but I do remember when he gave it to me. He shyly held it up to me and said, “I found this for you, Mama.” In his little boy hand was a rock in the form of a heart. And I loved it. My boy went through a phase, as many boys do, of collecting every rock he could find. Every rock was a treasure, held crystals, jewels, or fossils. I found rocks on the floor, on the couch, in the cushions. They would even fall out of the dryer whenever I opened the door. There were rocks everywhere. I never wanted to tell him that his lava rocks were really asphalt or his fossils were just strange sediments. It was his own little world and I was just there to sweep up after him. He was little at the time, back in his rock collecting days. These were the days when he didn’t have to worry about much and could leave buckets and Tupperware filled with rocks and cement bits in the garage. There was no such thing as “bullies” or “low self-esteem” or “drug awareness” or “strangers to avoid” or “inappropriate things on the internet”. He could steal flowers from the neighbors to give to me, and all he had was finding hearts in the rocks and sparkles where no one saw any. And that is what is still perfect about my little boy, seventeen years later. My boy still finds his rock and brings them home, even now though they are less rocks and more ideas of how the world should be. He still shares what he believes to be special just with me, and I still treasure these newly discovered hearts — filling my own in order to fight the darkness in my mind, and to remember my purpose in his life and mine. Here we are, seventeen years later.